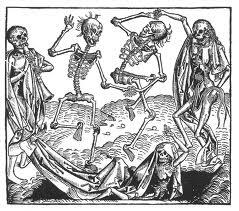 The onset of the Black Death in the wet summer of 1348 must have horrified the people of the time: within weeks of midsummer people were dying in huge numbers. 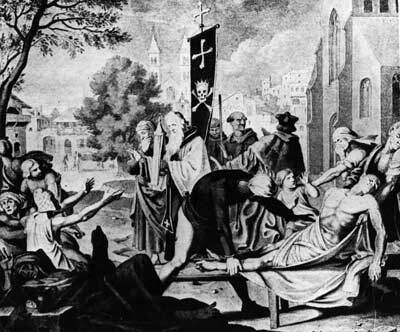 The long term effects of the plague were devastating and far reaching: agriculture, religion, economics and even social class were affected. Whilst communications were limited during this period, the residents of Weddington – peasants and nobles alike – must have listened with mounting dread to what accounts reached them of the plague’s onset, and one can only imagine the horror when the first plague cases emerged in the area. Ralph Higden of Chester, the best known chronicler of this time thought 'scarcely a tenth of mankind was left alive'. His analysis of the scale of the mortality is repeated by other commentators. The phrase'there were hardly enough living to care for the sick and bury the dead' is repeated in various sources, including a chronicle compiled at St Mary's Abbey, York. The 'Malmesbury Monk', writing in Wiltshire, reckoned that 'over England as a whole a fifth of men, women and children were carried to the grave'.The plague did not abate in the winter but became even more virulent in the early months of 1349 and continued into 1350. Chroniclers and administrators make numerous references to the extension of graveyards, and to the mass burial of bodies in pits. "Then the grievous plague penetrated the seacoasts from Southampton, and came to Bristol, and there almost the whole strength of the town died, struck as it were by sudden death. There died at Leicester in the small parish of St. Leonard more than 380, in the parish of Holy Cross more than 400; in the parish of S. Margaret of Leicester more than 700; and so in each parish a great number. Then the bishop of Lincoln gave general power to all and every priest to hear confessions, and absolve with full and entire authority except in matters of debt, in which case the dying man, if he could, should pay the debt while he lived, or others should certainly fulfill that duty from his property after his death. In the same year there was a great plague of sheep everywhere in the realm so that in one place there died in one pasturage more than 5,000 sheep, and so rotted that neither beast nor bird would touch them. And there were small prices for everything on account of the fear of death. For there were very few who cared about riches or anything else.... Sheep and cattle went wandering over fields and through crops, and there was no one to go and drive or gather them for there was such a lack of servants that no one knew what he ought to do. Wherefore many crops perished in the fields for want of someone to gather them.Meanwhile the king sent proclamation that reapers and other laborers should not take more than they had been accustomed to take (in pay). But the labourers were so lifted up and obstinate that they would not listen to the king's command, but if anyone wished to have them he had to give them what they wanted, and either lose his fruit and crops, or satisfy the wishes of the workmen. After the pestilence, many buildings, great and small, fell into ruins in every city for lack of inhabitants, likewise many villages and hamlets became desolate, not a house being left in them, all having died who dwelt there; and it was probable that many such villages would never be inhabited. In the winter following there was such a want of servants in work of all kinds, that one would scarcely believe that in times past there had been such a lack. And so all necessities became so much dearer." History of England by Henry Knighton, in Source Book of English History, by E.K. Kendall. Today we have the benefit of hindsight. We know, as fourteenth-century people suspected, that the mortality caused by the bubonic plague of the Black Death was the worst demographic disaster in the history of the world. We also know that the mortality came to an end in the first outbreak soon after 1350. People at the time however could not have known this would happen - so far as they were concerned everyone might well die. In Weddington, as elsewhere, many would have treated each day as if it were their last: moral and social codes were broken, while the marriage market was revitalised by those who had lost partners in the plague! We also know that the plague returned regularly, first in 1361 and then in the 1370s and 1380s and, as an increasingly urban disease, right through until the Great Plague of 1665 in London. But by around 1670 it disappeared from England for over two centuries until a number of outbreaks occurred either side of 1900. It was not until these modern outbreaks that the bacillus was identified and connection between rats and plague discovered. Despite all their best efforts, people in the historic period had no remedy against the mysterious plague except - as author Daniel Defoe put it - to run away from it. That said, from the early 1400s the ravages of the plague would have abated somewhat for the villagers of Weddington, as the virus became more concentrated in the larger towns and cities. 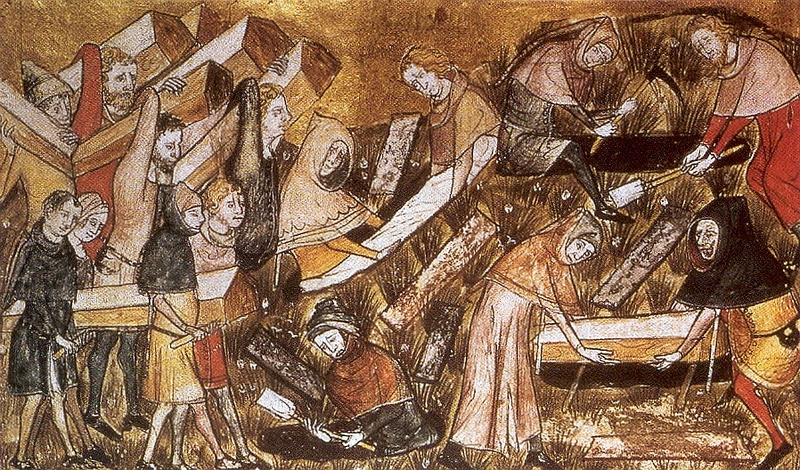 However, the after-effects of the plague were dramatic in Weddington as the vast majority of the population at the time of the Black Death were rural peasants. These suffered the highest mortality and in so doing, became much more expensive and choosy about where they worked, and how they related to their Lord. However, weakened communities provided the opportunity in the century and a half after the plague for landlords to clear lands and enclose them for sheep, so that Sir Thomas More, writing soon after 1500, saw the countryside as overrun and consumed by sheep. Weddington was no exception and during this period the Lords of the Manor gradually turned the land over to sheep pasture, this being easy to maintain (i.e. less expensive peasants) and providing profitable wool supplies. Documentary sources, such as the Lay Subsidy of 1332, tell us that there were twelve households in the village of Weddington prior to the plague. Piece of burnt timber from an original Weddington dwelling of the time, found in the Church fields on the site of the Deserted Medieval Village of Weddington. Indicative that the dwellings were burnt down at this time (pictured left)*. Remnant from a hearth of an original Weddington dwelling of the time, found in the Church fields on the site of the Deserted Medieval Village of Weddington (pictured left)*. However, it is also possible that Thomas Grey made a more positive contribution to the area during his lifetime, with some records suggesting that he built a Capital Mansion House - the earliest incarnation of Weddington Castle - at this time. It is possible that this was built upon the site of the earlier Royal Hunting Lodge, a common practise at this time. Despite establishing a base here, these times would have been extremely uncertain and tumultuous for Thomas Grey and those of his class. The sustained onslaught of plague on English population and society over a period of more than 300 years inevitably affected society and the economy – indeed it has been argued that the Black Death brought about the end of feudalism. Geoffrey le Baker, an Oxfordshire man, noted deaths among the nobility. And so there were: one of King Edward III's daughters, archbishops, bishops, abbots, abbesses, nobles and lords of manors died in the first outbreak. In 1361 the Duke of Lancaster, a leading general, was among the victims. Le Baker also noted the immediate effects on the young and strong: 'the weak and elderly it generally spared'. In 1361 we find references to the outbreak being especially fierce among children. However, there is no doubt that proportionately the hardest-hit part of society was the most numerous: the peasantry, labourers and artisans. Government and landlords tried to keep the lid on rising wages and changing social aspirations. Lords and peasants alike were indicted for taking higher wages. In 1363 a Sumptuary Law was brought through parliament. This measure decreed not only the quality and colour of cloth that lay people at different levels of society (below the nobility), should use in their attire but also sought to limit the common diet to basics. Such legislation must have occured when the government had observed upwardly-mobile dress among the lower orders. Such legislation was virtually impossible to enforce, but indicates that among those who survived the plague there was additional wealth, from higher wages and from accumulated holdings of lands formerly held by plague victims. In a sense the Black Death was the prehistory both of enclosure and of the Reformation. Cardinal Gasquet noted long ago that the plague led to the emergence for the first time of a middle class funded by accumulating the wealth of those who had died. The old medieval tripartite division of society into those who fought (the nobility and knights), those who prayed (the churchmen) and those who laboured (the peasants) was never the same again. Thus, whilst the residents of Weddington (and English society as a whole) gradually adapted to the ravages of the plague over these terrible two centuries, the social implications of this tragedy were to lead to further upheavals – both religious and political - culminating in the Reformation and the English Civil War. Both of these key events were to have a major impact upon the history of Weddington Castle and its inhabitants. It will be seen in the next section that the Reformation in particular would have dire consequences for Thomas Grey's grandson, Henry Grey, Duke of Suffolk.